For people with the surname Carton, see Carton (surname). A carton is a box or container usually made of paperboard and sometimes of corrugated fiberboard. 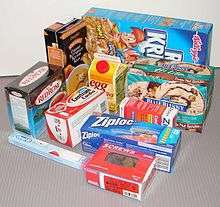 Many types of cartons are used in packaging. Sometimes a carton is also called a box. A carton is a type of packaging suitable for food, pharmaceuticals, hardware, and many other types of products. Folding cartons are usually combined into a tube at the manufacturer and shipped flat (knocked down) to the packager. Tray styles have a solid bottom and are often shipped as flat blanks and assembled by the packager. Some also are self-erecting. High-speed equipment is available to set up, load, and close the cartons. Egg cartons or trays are designed to protect whole eggs while in transit. Traditionally these have been made of molded pulp. This uses recycled newsprint which is molded into a shape which protects the eggs. 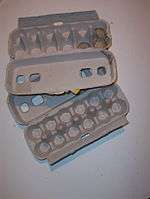 More recently egg cartons have also been made from expanded polystyrene (similar to styrofoam) and PET. Cartons for liquids can be fabricated from laminates of liquid packaging board, foil, and polyethylene. Most are based on either Tetra Pak or SIG Combibloc systems. One option is to have the printed laminate supplied on a roll. The carton is cut, scored, and formed at the packager. A second option is to have the pre-assembled tubes delivered to the packager for completion and filling. These are suited for aseptic processing and are used for milk, soup, juice, etc. Gable top cartons are often used for liquid products such as milk, juice, etc. These use polyethylene-coated liquid packaging board and sometimes a foil laminate. Most are opened by pushing open the gables at the top back and pulling the top (spout) out. Some have fitments to assist in opening and pouring the contents. The history of the carton goes as far back as 1879 in a Brooklyn, New York, factory operated by Robert Gair. A die-ruled, cut, and scored paperboard into a single impression of a folded carton. By 1896, the National Biscuit Company was the first to use cartons to package crackers. The next development of folded paper used to construct cartons are mentioned by Dr. Winslow of Seattle, Washington, in 1908 who claimed that paper milk containers were commercially sold in San Francisco and Los Angeles as early as 1906. The inventor of this carton was G.W. Maxwell. However, it was in 1915 that John Van Wormer of Toledo, Ohio, was granted the first patent for the first "paper bottle," which was the first folded blank box for holding milk. He called it the "Pure-Pak." The milk carton was original in the sense that it could be folded, glued, filled with milk, and sealed at a dairy farm. The early 1960s brought many automated systems to help with production of repeatable processes. It was at that time that an engineer from Detroit, Michigan, named Mario Lepore developed a machine to fold and seal a gable top paper carton. An early American packaging industry pioneer was the Kieckhefer Container Company, which was run by John W. Kieckhefer. The company excelled in the use of fibre shipping containers, which especially included the paper milk carton. In 1957, through an exchange of stock, the Kieckhefer Container Co. holdings were merged with the Weyerhauser Timber Company of Tacoma, Washington. Although quite often shaped like a cuboid, it is not uncommon to find cartons lacking right angles and straight edges, as in squrounds used for ice cream. Tetrahedrons and other shapes are available. Cartons with a hexagonal or octagonal cross sections are sometimes used for specialty items. Cartons can be made from many materials: paperboard, duplex, white kraft, recycled and many more various plastics, or a composite. Some are "food grade" for direct contact with foods. Many cartons are made out of a single piece of paperboard. Depending on the need, this paperboard can be waxed or coated with polyethylene to form a moisture barrier. This may serve to contain a liquid product or keep a powder dry. In art history, the carton (pronounced the French way) was a drawing on heavy pasteboard or paperboard, used as life-size design for the manufacture in an atelier of a valuable tapestry, such as a gobelin. During the weaving it hung behind the tapestry in the making, a time-consuming process thus in a creative sense simplified to 'mechanical' painting-by-numbers. As these were extremely valuable, often commanded by the very richest art-buyers, including princes who hung them in their palaces and even took them on their travels as prestigious displays of wealth, often with a visual message, especially the world-famous Flemish ateliers were deemed worthy to have cartons made by some of the greatest graphic artists of the time, including such celebrated painters as Rubens. Carton-pierre was a material used for the making of raised ornaments for wall and ceiling decoration. It is composed of the pulp of paper mixed with whiting (ground calcium carbonate) and glue, this being forced into plaster moulds backed with paper, and then removed to a drying room to harden. It is much stronger and lighter than common plaster-of-Paris ornaments, and is not so liable to chip or break if struck with anything. ↑ The packaging designer's book of patterns. Bilimsel Eserler. ↑ Food packaging: principles and practice. CRC Press. Look up carton in Wiktionary, the free dictionary.